The push by hotels to swamp travelers with fees is expanding: The fees you used to only find at resorts are moving downtown. Many big-city hotels are adding mandatory facility fees or urban-destination fees to hotel bills, hiding the add-ons, which sometimes reach $50 a night, from advertised room rates. The Boston Park Plaza adds a required $22 fee per room per night. The St. Regis in New York, often more than $800 a night, now adds a $50 mandatory destination fee. There’s a $25 a night resort fee at the Radisson Blu Aqua in downtown Chicago. Same at the Hilton Anatole in Dallas. Neither are what most travelers would consider a resort. New fees come in all shapes and sizes. Jeff Cappelletti, a Florida-based consultant who travels frequently, was shocked to see a $1 per night housekeeping gratuity on his bill in addition to a $29.95 daily resort fee at the Grand Sierra Resort & Casino in Reno, Nev.
“The fees are out of control,” he says. Mr. Cappelletti likens the pricing to online retailers who post a low price on an item and then add above-cost shipping fees. “You do not know the price until just before you buy,” he says. Fees are growing at airlines, too. Airline baggage fees totaled $4.8 billion at U.S. airlines in the 12 months ended Sept. 30, according to the Bureau of Transportation Statistics. That was up 8% over the previous 12 months, and likely to go higher with a price increase to $30 for the first checked bag from $25 at American, Delta, United and JetBlue last fall. With hotels, resort and destination fees increased 400% last year over 2017 and will spread to the suburbs this year, says Bjorn Hanson, an industry consultant and adjunct professor at New York University’s hospitality center. Mr. Hanson’s annual survey of hotels found that overall fees and surcharges, including things like early check-in fees, minibars, cancellation fees and a host of other add-ons, increased 8.5% in 2018 from the previous year. Hotels are enjoying high occupancy and record profitability, but room rates are increasing only at about the same pace as inflation. At the same time, hotels have faced higher labor and borrowing costs, plus higher real estate taxes, Mr. Hanson notes. In addition, fees for Wi-Fi service and telephone-use have declined. So hotels are getting creative to maintain profitability. Some hotels have pushed parking fees higher or added charges for in-room safes or bellhop services, whether you use them or not. Some have gotten more aggressive with cancellation penalties. Some hotels offer credits at their own bars and restaurants and free Wi-Fi to placate guests angry over the fees. Others load up previously free hotel services as justification for the new fees. Some offer services business travelers likely would never use, like a personal shopper at a local department store, an audio tour of a nearby landmark or free local calls. The Boston Park Plaza offers a laundry list of services its facilities fee covers. (Laundry isn’t one of them.) What is included: high-speed Wi-Fi, unlimited phone calls, complimentary boarding pass printing, access to the fitness center, access to digital news and magazines, checkout via guest-room TV and complimentary notary services Monday to Friday. Hotels argue the fees can actually represent a good deal for guests. The “value” of the daily $25 destination amenity fee at the JW Marriott Essex House in New York is $107, according to Marriott spokeswoman Kathleen Duffy. The fee includes a $25 daily food and beverage credit, plus seasonal activities such as ice skating in the winter or bicycle rental in warmer months. Of course if it were all about a good deal for guests, it would be optional, not mandatory. Even food and beverage credits can be annoying if guests don’t want to eat at the hotel. 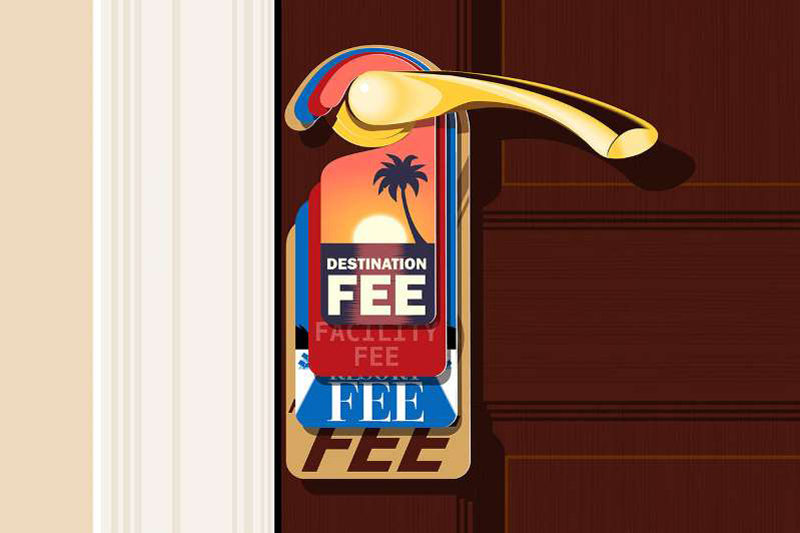 The added fees are waived on a case-by-case basis, Ms. Duffy says, only when the traveler can convince the hotel he or she didn’t see notice of the charge when booking. Not all hoteliers are enamored with the fee frenzy. Robert Rauch, a San Diego-based hotel owner, operator and consultant, says only one of the 16 hotels in his portfolio has a resort fee. It’s been a longstanding $5 daily charge with few complaints, so he decided to let it stand when he took over management of the property. One survey of hotel customers showed that 15% of guests insist on making hotels take resort fees off their bills, he says. “The other 85%, I don’t know how many of them are angry, disappointed or feel like they’ve been taken advantage of,” says Mr. Rauch, chairman and chief executive of RAR Hospitality. But revenue pressure is real, he says. If hotels rely on fees, he thinks they should be more transparent about the total cost of a stay. Online booking services have scrambled to display notice of the mandatory fees, just as they have added information about airline baggage fees and warnings about unique airline fares like Basic Economy. At Hotels.com, sometimes disclosure of mandatory resort fees shows up right away when prices are first posted for different types of rooms. Sometimes it isn’t until you make a selection and get to a credit card payment screen. Booking Holdings, the parent of Kayak, Priceline, Booking.com and others, says all its brands show the total price sometime before a customer clicks to complete a booking. Hotels are required to enter the mandatory fees when they load their prices and availability, a Booking spokeswoman says.